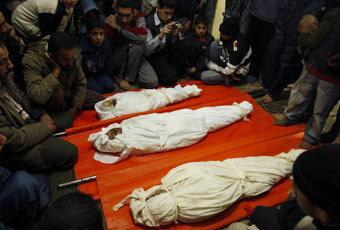 Ba'losha family: Samar, 13, Dina, 8 and Jawaher, 4. Part three of a series recounting the findings of South African jurist Richard Goldstone's UN Fact Finding Mission on the Gaza Conflict. 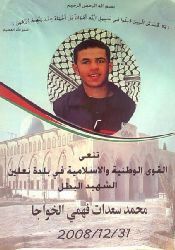 On 29 December 2008, Hani Al-Mahdi, 27, died when a Grad-type missile fired from Gaza exploded at a construction site in Ashkelon. The same day, in a separate incident, Irit Sheetrit, 39, was killed and several wounded when a Grad exploded in Ashdod. Hamas' Al-Qassam Brigades claimed responsibility for the attack. 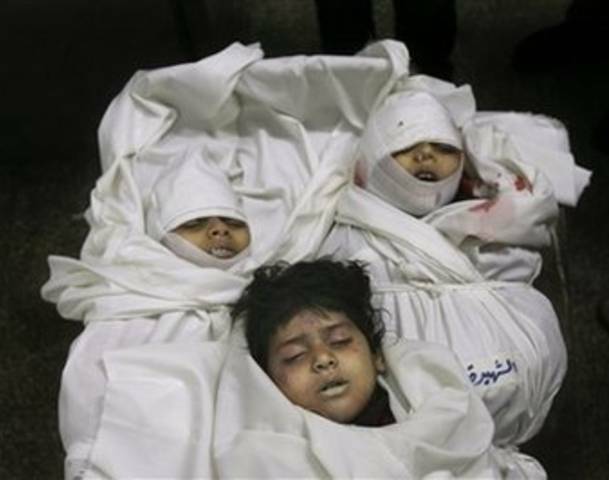 assault on the Gaza Strip, were two out of only three cases in which Israeli civilians were killed by projectile fire during the three-week operation that began on 27 December 2008. Meanwhile, the Palestinian toll rose to 364, according to medics, who estimated that 1,500 Gazans had been injured by then-ongoing airstrikes that continued for a third day. Israel said its warplanes struck 100 targets, including the headquarters of five de facto government ministries and the UN Special Coordinator's Office (UNSCO) in Gaza City. Palestinian military groups, increasing their targeting of Israeli sites two-fold compared to the prior 48 hours, launched 66 homemade projectiles and 14 mortars by midnight. The attacks killed the two Israeli civilians, including a Palestinian-Israeli, and at least one soldier. Richard Goldstone's UN fact-finding mission offers a damning indictment of Palestinian projectile fire, of which his mission found evidence was often directed toward civilians rather than military targets during the winter assault. "The Mission has determined that the rockets and, to a lesser extent, the mortars fired by the Palestinian armed groups are incapable of being directed towards specific military objectives and have been fired into areas where civilian populations are based. "The Mission has further determined that these attacks constitute indiscriminate attacks upon the civilian population of southern Israel and that, where there is no intended military target and the rockets and mortars are launched into a civilian population, they constitute a deliberate attack against a civilian population. These acts would constitute war crimes and may amount to crimes against humanity. "Given the seeming inability of the Palestinian armed groups to direct the rockets and mortars towards specific targets and given that the attacks have caused very little damage to Israeli military assets, the Mission finds that there is significant evidence to suggest that one of the primary purposes of the rocket and mortar attacks is to spread terror among the Israeli civilian population, a violation of international law. "Noting that some of the Palestinian armed groups, among them Hamas, have publicly expressed their intention to target civilians in reprisal for the civilian fatalities in Gaza as a result of Israeli military operations, the Mission is of the view that reprisals against civilians in armed hostilities are contrary to international humanitarian law." The report notes that the vast disparity between victims of Israeli attacks, estimated at some 1,400 deaths, and Palestinian operations, leaving dead 13 Israelis, most likely had little or no relationship to armed groups' efforts to protect civilians. In fact, according to the mission, the relatively few casualties sustained by Israeli civilians is due in large part to the precautions put into place by Israel. This includes an early warning system, the provision of public shelters and fortifications of schools and other public buildings. Israeli civilians also enjoyed protection from injury because the bulk of armed groups' artillery consisted of homemade projectiles fashioned from rudimentary materials, such as hollow metal pipes. "They are relatively unsophisticated weapons and lack a guidance system, and so cannot be aimed at specific targets," the Goldstone report notes. While the mission acknowledges an occupied people's right to resistance, "including the right to resist forcible deprivation of their right to self-determination and the right to live, in peace and freedom, in their own State," it insists that Israelis also "have the right to live in peace and security. Both peoples are entitled to justice in accordance with international law." In turn, the report alleges that armed groups in Gaza have displayed and continue to display consistent disregard for international humanitarian law. "The Mission is aware that Hamas continues to view all armed activities directed against Israel as resistance to occupation and practices of the occupation, and, therefore, a legitimate right of the Palestinian people. The Mission fully recognizes the Palestinian people's right to self-determination," the report states. "It also acknowledges that United Nations bodies and others have repeatedly pointed out practices of the Israeli occupation that deprive Palestinians of their human rights and fundamental freedoms. Nevertheless, the Mission forcefully reiterates that the peremptory norms of customary international law ... apply to all actions that may be undertaken in response to, or to oppose, human rights violations." It continues: "There is no justification in international law for the launching of rockets and mortars that cannot be directed at specific military targets into areas where civilian populations are located. Indeed, Palestinian armed groups, among them Hamas, have publicly expressed their intention to target Israel civilians. The al-Qassam Brigades, on their website, claimed responsibility for the deaths of each of the Israeli civilians killed by rocket fire during the operations in Gaza. "From the facts it ascertained, the Mission finds that the Palestinian armed groups have failed in their duty to protect and respect civilians. Even though the al-Qassam Brigades and other armed groups in Gaza have recently claimed that they do not intend to harm civilians, the fact that they continue to launch rockets at populated areas without any definite military targets and are aware of the consequences to civilians indicates an intent to target civilians." Given the gravity of its allegations, the commission said it sought clarification from armed groups during its investigations over the summer, requesting consultations with representatives. "However, the groups were not agreeable to such a meeting. ... Despite various attempts, the Mission was unable to contact members of armed factions operating within the Gaza Strip." The commission, consequently, "had little option but to rely upon indirect sources to a greater extent than for other parts of its investigation." Among those were media reports in which military representatives confirmed and justified the use of projectiles during the assault. The Goldstone report cites remarks, during an interview with Ma'an, in which a representative of the Popular Front for the Liberation of Palestine (PFLP) stated two days before the end of the war that "the rockets are both practical and a symbolic representation of our resistance to the occupier." Additionally, in its efforts to gather more direct information on the subject, the team raised questions regarding the conduct of certain groups. According to its final report, those interviewed in Gaza appeared reluctant to speak about the presence of or conduct of armed groups. "Whatever the reasons for their reluctance, the Mission does not discount that the interviewees' reluctance may have stemmed from a fear of reprisals." For its part, the de facto government reportedly cooperated in full, responding that it "had nothing to do, directly or indirectly, with al-Qassam Brigades or other armed groups and had no knowledge of their tactics." "While noting that the weaponry used by the armed factions was not accurate, the Gaza authorities discouraged the targeting of civilians," according to the report. In the de facto government's view, it took "the initiative to spare civilian lives when they renounced suicide attacks in April 2006. ... a Government spokesperson stated that the resistance factions did not aim their rockets at civilians but rather at IDF [Israel Defense Forces] artillery and other positions from which attacks against Gaza were launched," the report states. However, the team "found no evidence of any system of public monitoring or accountability for serious violations of international humanitarian law and human rights law set up by the Gaza authorities. The Mission is concerned with the consistent disregard for international humanitarian law with which armed groups in the Gaza Strip conduct their armed activities ... Despite some media reports, the Mission remains unconvinced that any genuine and effective initiatives have been taken by the authorities to address the serious issues of violation of international humanitarian law in the conduct of armed activities by militant groups in the Gaza Strip. "The Mission was also given no evidence of any arrests, investigation or prosecution connected with the serious violations of the peremptory norms of international law that have been alleged." Among the commission's conclusions are that the de facto government is responsible for ensuring that effective measures for accountability for violations of international human rights law and international humanitarian law committed by armed groups acting in or from Gaza are established. It points out that such responsibility would continue to rest on any authority exercising government-like functions in the Strip. "The Mission concludes that the rocket and mortars attacks, launched by Palestinian armed groups operating from Gaza, have caused terror in the affected communities of southern Israel. ... The Mission recommends that Palestinian armed groups should undertake forthwith to respect international humanitarian law, in particular by renouncing attacks on Israeli civilians and civilian objects, and take all feasible precautionary measures to avoid harm to Palestinian civilians during hostilities." Part two of a series recounting the findings of South African jurist Richard Goldstone's UN Fact Finding Mission on the Gaza Conflict. An estimated 300 Palestinians were killed in the first 48 hours of Israel's winter assault on the Gaza Strip, which entered its second day one year ago today. With an increased focus on Rafah, Israeli warplanes bombarded around 100 more targets on 28 December 2008, leaving about 70 more Palestinians dead, and raising the child death toll to 22 and the civilian toll to 60, including nine women. Israeli jets struck Islamic University in Gaza City, the offices of de facto Prime Minister Ismail Haniyeh, and the Saraya prison, ironically killing four members of Hamas' domestic rival Fatah, as well as three mosques and 11 homes and apartments. Fires engulfed Rafah after Israeli missiles hit underground fuel pipelines in some 40 sorties on the Strip's tunnel network. Fleeing the flames, terrified residents of Gaza's south attempted by the hundreds to escape to Egypt, but were prevented from leaving by Egyptian security forces. A Palestinian and an Egyptian policeman were killed in the ensuring chaos; at least 10 others were hurt. Palestinians in the West Bank, horrified by the numbers of dead and more than 1,000 injured, protested against the operation on its second day. Palestinian Authority security forces broke up a demonstration in Ramallah when activists urged support for Hamas, while Israeli forces shot dead three demonstrators nearby. "There was a significant increase in the use of force by Israeli security forces during demonstrations in the West Bank after the start of the Israeli operations in Gaza," according to the final report of Richard Goldstone's UN fact-finding mission. "The degree of force used against protests during the previous year had already been high ... New tactics and weapons used by the Israeli security forces aimed at suppressing the popular movement have resulted in deaths and injuries." In July 2009, two witnesses, Mohamed Srour and Jonathan Pollak, described to the UN investigators in Geneva the fatal shooting of the two young men from the West Bank village of Ni’lin during a demonstration against the Gaza operation. Srour, elected mayor in 2005, was himself shot in the leg during the same protest. "This demonstration was like any other demonstration. These demonstrations always took place and were peaceful demonstrations," Srour explained. "And there was the presence of Israeli and foreign supporters and very high-level MPs. So it was very clear that this demonstration was a peaceful one." As the protest was winding down, Israeli forces used tear gas and stun grenades to disperse the crowd. The two young men who died were part of a small group of demonstrators, some of whom had thrown stones at the soldiers. In video footage, four or five soldiers appeared to be casually walking around and not seemingly threatened. Dozens of rounds of live ammunition were fired in the direction of the group of young men, hitting three of them within minutes of each other. rubber bullets and tear gas and between live ammunition," recounted Pollak, an Israeli activist. "When I told them that it's live ammunition, they didn’t believe me. They said, 'No, it's just blanks that they're shooting. And they're not going to shoot us.'" Mohamed Khawaja was shot in the forehead; Arafat Khawaja, who had turned to run away, was shot in the back, and Srour was shot in the leg. Subsequently, an ambulance was prevented from reaching the victims, who had to be carried some distance and were eventually put onto a pick-up truck, at which the army fired tear gas. "There were shouts that another person was shot. People said, 'Call the medics. There's another person wounded.' And we put Mohamed on the ground. Some people stayed with him and I ran back immediately. "And then I saw Arafat Khawaja being carried. And there weren't enough people carrying him. His head was slinging back, and I grabbed his head and my hand was covered with his blood. He was shot in the back. ... I got to him and I looked back. And I saw Mohamed being shot – I saw Mohamed fall down. And people were shouting that another person was shot. "There was no ambulance there because it was prevented from entering the village at the entrance, at the roadblock in the entrance. His blood kept gushing from this back and his legs were a bit higher so it, it dripped, through the back of his head. He was shot in the back, which, I mean, I would tend to say murder because he was with his back to the soldiers and absolutely not endangering anyone. But, I assume, legally it can not be called murder because we can't prove intent. But in the least, it's willful killing." Added Srour, "There was no care, whatsoever, for human life." According to South African jurist Richard Goldstone's final report, "The Mission has asked the Government of Israel to explain the increased use of live ammunitions during demonstrations in the West Bank, but has received no reply." Both Srour and Pollak said that by the second day of the war, the atmosphere encountered with soldiers and border police had already become markedly different from the situation before the operations in Gaza. "The atmosphere of the incident, and during and after the start of the war generally, was that all checks and balances had been removed. The soldiers were saying things related to the Gaza war, taunting things like, 'It’s a shame we're not in Gaza killing Arabs,'" Pollak said. "They were taunting us. They were cursing at us. They were laughing about what was happening in Gaza at the same time. This was the second day of the war, of the assault. And people were unbelievably angry." Israeli forces arrested Srour at the Allenby crossing upon his return to the West Bank on 20 July. He was subsequently released on bail. Israel's Permanent Representative to Geneva said the arrest was unrelated to his appearance at the public hearing days earlier. During his testimony, however, Srour had expressed fear Israel would retaliate for his remarks at the UN. "I know full well that I will pay the price for this testimony when I return at Israeli crossing points in my journey of return after this hearing," he said. At least 800 Israeli protesters, most of them of Palestinian descent, were arrested during the Gaza war. "The Mission recommends that the Government of Israel should refrain from any action of reprisal against Palestinian and Israeli individuals and organizations that have cooperated with the United Nations Fact Finding Mission on the Gaza Conflict, in particular individuals who have appeared at the public hearings held by the Mission in Gaza and Geneva and expressed criticism of actions by Israel." An Israeli news outlet reported on Monday that the country’s Ministry of Foreign Affairs completed its response to a UN report alleging war crimes in Gaza. Israel refused to cooperate with South African Jurist Richard Goldstone's UN Fact Finding Mission into last winter's Gaza war. In November the UN General Assembly asked Israel and Palestinian authorities to carry out their own investigations of the allegations in Goldstone’s 575-page report on the Gaza war. The website of Israel’s Reshet Bet radio station reported that Israel will soon deliver its response to UN Secretary-General Ban Ki-moon after Israel’s political and military leaders debate whether to make public their findings. The news site also said that Israel’s response was the result of months of deliberations involving the Prime Minister’s Office, the Justice Ministry, the National Security Council, and the Foreign Ministry. The report also says a senior Israeli military official recently presented UN officials in New York with an Israeli rebuttal of Goldstone’s findings, including the results of 120 domestic investigations. Hundreds of women and children were among the 1,400 Palestinians killed in Israel’s three-week attack on Gaza last winter. Thirteen Israelis also died. The first part of a series recounting the findings of South African jurist Richard Goldstone's UN Fact Finding Mission on the Gaza Conflict. During the first four minutes of Israel's devastating winter assault on Gaza, launched 11:25am local time one year ago today, over 60 warplanes struck 50 targets, killing and injuring hundreds by midnight. At least 228 Palestinians lost their lives during the opening hours of the offensive, including 25 women and children, making 27 December 2008 the deadliest day for the local population in the occupied territories since Israel first invaded in 1967. Medical officials say some 700 Palestinians were injured by nightfall, 140 of them seriously. Hospitals turned away patients as doctors performed multiple surgeries in the same operating theaters, as well as in ordinary examination rooms. "The situation – actually there was chaos, total chaos," according to the head of the World Health Organization (WHO) in the Strip, Mahmoud Daher, who was enjoying his day off when Israeli fighter jets leveled the Gaza City police headquarters just south of Ash-Shifa Hospital, the first medical center to receive the injured and dead. "I was on leave that day. At around 11:30 the Israeli fighter bombers targeted the area. We heard very loud explosions. I heard the explosions, and I'm talking here in my capacity as a WHO officer, and in my capacity as a Gaza citizen," he told Richard Goldstone's UN fact-finding mission. "There was a great number of injured pouring into the hospital. I was not able to talk to any of the hospital officials because they were all busy, very busy caring for the patients." The first attacks came during scheduled lunch breaks for tens of thousands of school children, a choice of timing widely blamed for the day's inordinate toll in killed and injured minors. Eight students died during an UNRWA training course when an Israeli missile struck a PA office housed next door. Daher recounted: "I was scared because my children were at school. I went to my children's school and I tried to take my daughters out of the school. There was panic all over the school. Parents rushed to the school to get their children. I was able to take my daughters back home. So we did not understand the situation at the beginning. We didn't know – was that only [one] air raid, or was that just the beginning of an all-out war. We didn't really understand the situation as such." According to Israel's own assessment of what its army termed Operation Cast Lead, a number of non-military facilities were deemed acceptable targets because of their connection to the Hamas-run, de facto government in the coastal territory. "This operation is different from previous ones. We have set a high goal which we are aiming for. We are hitting not only terrorists and [rocket] launchers, but also the whole Hamas government and all its wings," announced Israel's deputy chief of staff, Maj Gen Dan Harel. "After this operation there will not be one Hamas building left standing in Gaza, and we plan to change the rules of the game." Israel broadly interpreted the definition of Hamas-linked facilities, however, targeting Palestinian Authority and civilian infrastructure throughout Gaza. As many as 165 police officers died on the first day of the assault in multiple airstrikes on PA security compounds in Gaza City and Rafah, as well as civil police stations and naval posts. About 60 new recruits died in a single attack on a police academy graduation ceremony in Gaza City, just minutes into the three-week assault. Between 250 to 300 patients hurt in that strike were immediately transferred to Ash-Shifa Hospital, which was quickly overwhelmed, according to Daher, the WHO chief. He noted: "A certain number of the surgical operations could not absorb this great number of injured. That is why there was more than one surgery carried out in the same room at the same time. Of course, under normal circumstances, this would not happen, but there was no other choice but for the medical crews to operate this way. "There was this great number also of patients and injured lying on the floor, simply because there was not enough beds. They were treated while lying on the floor. The operations were also carried out in the ordinary rooms, but these were not equipped with the necessary equipment for surgery." Strangled by the years-long Israeli and Egyptian blockade, Daher said Gaza was entirely underprepared even for the first day of hostilities. "On December 26th, 2008, the night before the first Israeli bombing, the Palestinian health care warehouses had shortages in about over 100 basic medical items ... So many of the medicine items were lacking. I'm talking about 100 most basic medicine items for a period of one month. I think 250 medicine items [and] consumable items were lacking." Days later, the arrival of foreign specialists and aid filled some gaps, the official noted. But Daher applauded his colleagues' steadfastness in the face of attacks that would eventually kill 16 medics in the line of duty, as well as destroy ambulances and health facilities. "The medical crews were present around the clock. And during the weeks, the first weeks of the war when the ground troops invaded Gaza ... their daily movements posed risks, great risks for them," he said. "They were extremely tired; they were exhausted. And yet they performed in a remarkable manner, and they were able to exert [every] effort, despite all the pressure, despite all the tasks, despite the great number of injured pouring in at any moment."